1974. That 's when the journey began. It was one man's passion about the art of signmaking that has evolved into a company's mission. We are a team of industry specialists working together to produce amazing sign products. Products that encourage, excite, enlighten and engage. Products that ultimately help build your company. We are passionate about designing and building signs. You can see it in every detail of our work. We believe that signmaking is a craft utilizing our skill and artistic talents to create and build. We invite you to share our passion. Our mission is to be the West Coast leader in the design and fabrication of complex architectural signage. Our attention to detail and quality will be expressed in all of our projects whether it is design, fabrication, installation or lighting service. In accomplishing our mission, we employ knowledgeable co-workers who have an understanding of the importance of detail in their efforts and who are dedicated to quality and customer service. We value innovation, creativity, ingenuity and hard work that results in projects that contribute to the goals and objectives of our customers and which have a suitable influence on the surrounding locality. We value accuracy in all of our endeavors knowing that our customers deserve no less from us. It is required of us each and every time if we expect to maintain our reputation for quality and for providing excellent value to the customer. We value total integrity, personal and professional. We understand it is the accepted standard in order to earn the respect and trust of all those we come in contact with especially our customers, co-workers and suppliers. We value our co-workers and will treat them with the same level of respect, support and professionalism with which we treat each valued customer. Quality starts with our production facility. 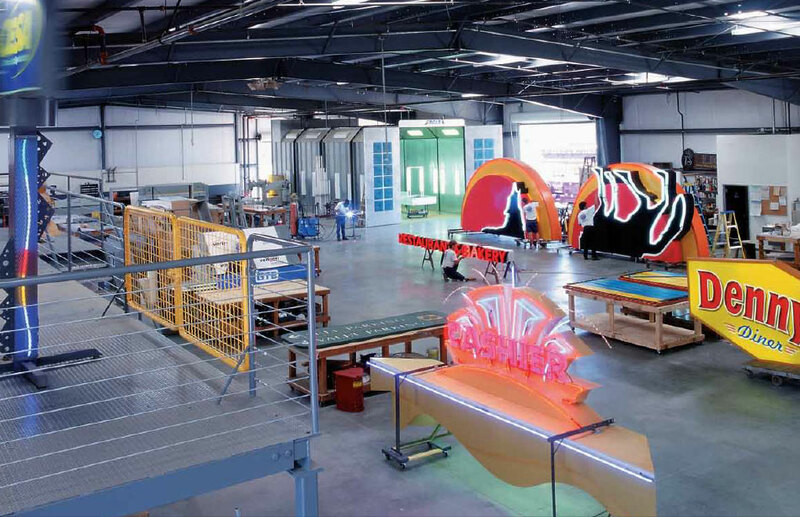 Our 15,000 square foot production facility is designed specifically for the production of state-of-the-art signs and sign programs. The details of sign fabrication are carried out in an environment that is technologically advanced and allows our skilled team the tools to perfect their craft. You can see our attention to design detail and construction quality in every product that leaves our shop.